The fishing throughout this period was outstanding with many fish caught on every session. Generally catching 10 or more fish per person. 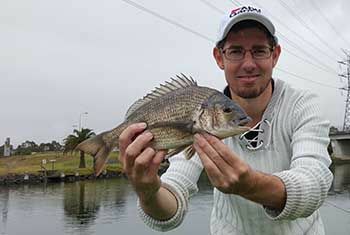 The majority of catches were good size Bream ranging from 20cm to 37cm which all seemed very clean and healthy. We also had a number of large run of pinkies. The most successful baits over this period were certainly live Scrub worms and maggots. Dead baits got the occasional bite but didn’t fish anywhere near as well. A successful method was to continually surround the area with a constant burley trail.